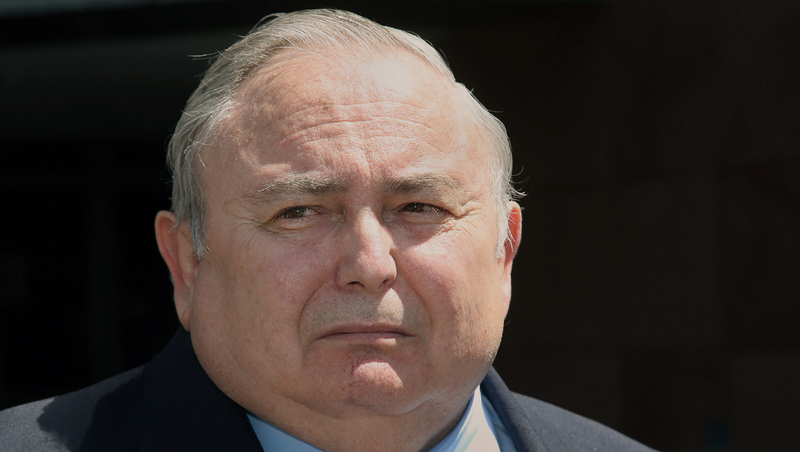 LOS ANGELES - Robert Rizzo, the former city manager of Bell, Calif., was sentenced Wednesday to 12 years in prison and ordered to make restitution of $8.8 million in a corruption scheme that nearly bankrupted the small, blue-collar city. Rizzo, 60, apologized during sentencing in Los Angeles County Superior Court, telling the judge he breached the public's confidence. Rizzo previously pleaded no contest to 69 counts including conspiracy, misappropriation of public funds and falsification of public records. On Monday, Rizzo was sentenced separately to 33 months in federal prison for income tax evasion after he acknowledged reporting more than $700,000 in phony deductions to reduce tax liability on money authorities say he stole from Bell. The sentence in the corruption case will run concurrently with the federal term. Rizzo will serve the first 33 months in federal prison then go to state prison. He will be on parole for three years after he serves his time. At the time of his plea in the corruption case, Rizzo had offered to help prosecutors convict his chief assistant, Angela Spaccia, who was later sentenced to nearly 12 years in prison. Defense attorney James Spertus said Rizzo's acknowledgement of his wrongdoing and offer to help prosecutors warranted a sentence of no more than five years in the corruption case. "By imposing a sentence on Mr. Rizzo that contrasts sharply with the 11.5-year sentence already imposed on Ms. Spaccia, the court can send an appropriate message to the public: acceptance of responsibility and cooperation matter," Spertus said previously. In Bell's main business district, at its community center and elsewhere, residents and business people were nearly unanimous earlier this week in their opinion that nothing short of a life sentence would be sufficient for what Rizzo had done to them. "Is he going to get life? He should. He never cared about us, all he cared about was our money," said recent Bell High School graduate Jose Morales, who was riding his skateboard outside the community center on Tuesday because Bell is now so broke it can't reopen its only skate park. Authorities said the city of 36,000 was looted of more than $5.5 million by a number of officials. Spertus has indicated that Spaccia, as the official who drew up illegal employment contracts that gave Rizzo his salary and benefits and herself $564,000, played perhaps an equal role in the scam. Most of the City Council members were also making about $100,000 a year for meeting about once a month. They face terms ranging from probation to four years in prison when they are sentenced later this year. Los Angeles County District Attorney Jackie Lacey has called the scandal the biggest municipal corruption case her office ever prosecuted. Residents were so angry that thousands marched on City Hall to scream at the officials, and a few months after the scandal broke, they held a recall election and tossed them out of office. It was Rizzo who told those officials what to do, said licensed tax preparer Maria Berumen, who sat in her office and ticked off a litany of misdeeds investigators uncovered. An audit by the state controller's office found Bell illegally raised property taxes, business license fees, sewage fees and trash collection fees; illegally diverted gas taxes and other state and federal funds; and issued $50 million in voter-approved municipal bonds for a public park that was never built. A good portion of that money, auditors found, went into the lucrative salaries and pensions that Rizzo, Spaccia and other top officials collected. "The city of Bell's internal control system was virtually non-existent," state Controller John Chiang said when the audit was issued. "All of the city's financial activities and transactions evolved around one individual - the former chief administrative officer."